Last week, the hulking blue and vacant Alstom plant site was a ghost town of industrial buildings and empty parking lots — the lonely testament of jobs and decades gone by. Pretty much the only life left on what many Chattanoogans remember as the old Combustion Engineering plant property was a few stubborn grasses — grown tall and waving in the breeze off the Tennessee River that flows just behind it. An aerial view of the Alstom site as shown in this 2011 staff file photo. But this week, new laborers began demolishing some of the older industrial buildings, and soon earthmovers will be peeling up the concrete. It may ultimately take 10 to 25 years, but already this long-hidden, downtown-sized tract directly across the river from Moccasin Bend's eastern shore is on its way to becoming Chattanooga's next great neighborhood. Think Southside on steroids — and with a riverfront. Think North Shore all new. 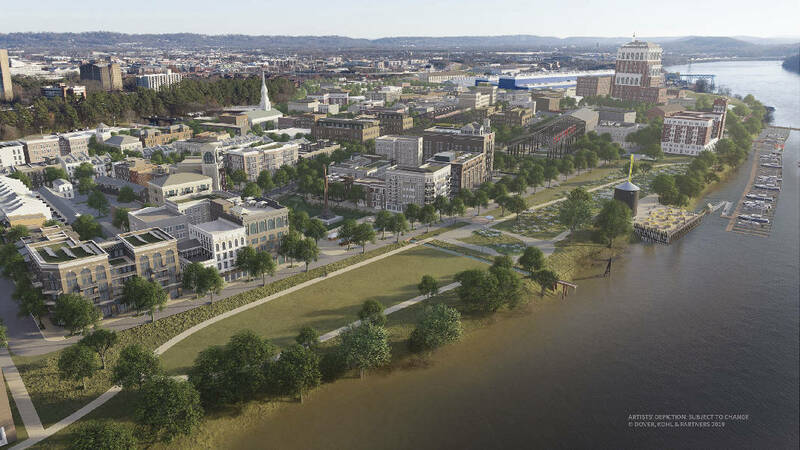 Think an expanded downtown Chattanooga with full access to the river on two sides, not just one. Think bold. Because that's what Chattanooga real estate developer Jimmy White and local hotelier Hiren Desai are doing as they work to reinvent their $30 million purchase of a $500 million plant and its 112-acre property into a mixed-use development they expect will bring $2 billion to $3 billion in investments. 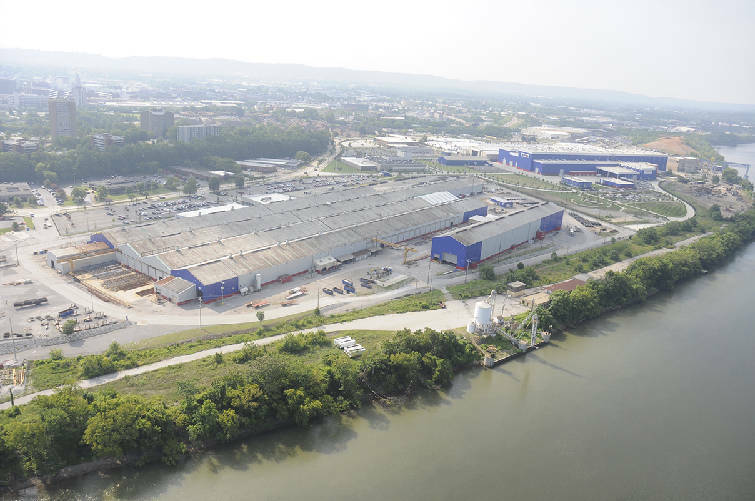 The proposed new West End — stretching along the river from 19th Street to Martin Luther King Boulevard — will utilize the like-new Blue High Bay buildings with the largest crane on the Tennessee River (and maybe in the Eastern U.S.) and an $88 million vacuum-sealed chamber to lure jobs from "the next big industrial guy in town," says White. But nearby on the rest of the property will be densely packed townhomes and condos for millennials and retirees, office buildings, parking structures, a 10,000 square-foot food hall and music venue, a canal, a brewpub, a child care center, dog park, green space — even 1,500 trees. Main Street will be extended all the way to the river. "Our goal is to bring the city to the river but also to bring the river back to the city," said White, a Chattanooga native. He says the project could take up to 25 years to complete, but once finished, it will be like "a whole other downtown." White and the project planner, Victor Dover, on Thursday invited public comment and presented the plan in front of the Star Wars-like vacuum-sealed chamber Alstom built for testing turbines in anticipation of a renaissance in the nuclear industry. That renaissance was cut short before it began by the meltdowns in Fukushima, Japan. The presentation drew about 150 people, but few questions or comments — an indication of the wow-factor in this bold and grand plan that we think has as much potential for good in Chattanooga as a certain once thought to be pie-in-the sky plan here to build an aquarium. Does Chattanooga have the bandwidth to support another Southside, another North Shore, a "whole other downtown" on a sprawling, almost blank canvas right alongside the river and looking across to what eventually will be the new Moccasin Bend National Archeological District of the Chickamauga and Chattanooga National Military Park? We think so. Especially if White and the city's industry shoppers can find a good jobs partner to move into the amazing turn-key plant that Alstom built. We think it might even be a whole other, better downtown — one planned and fitted for today's world.